For over ten years Long Island Tile and Grout Cleaning Service has been servicing Nassau and Suffolk Counties restoring kitchens and baths to there original luster. Our customer service and quality of service is exceptional. Call us today to schedule a free in home estimate and demonstration. 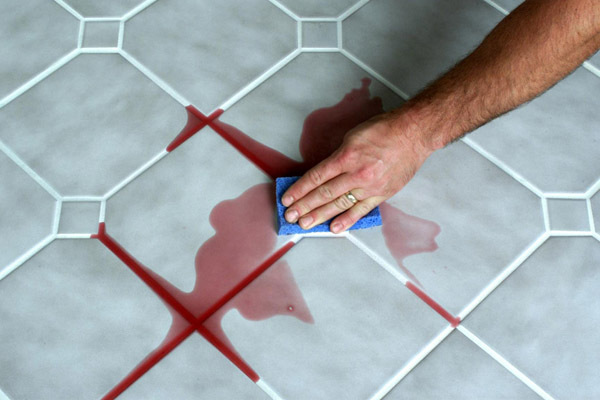 Our color seal process will re-color your grout while making it stain and water resistant as well as mold and mildew resistant. Color seal is designed to last for years and in many cases when properly maintained may last as long as the grout itself. Our color sealer is virtually odorless and safe for families and pets. Long Island Grout Cleaners color seal can also be used on tile walls in and out of showers as well as back splashes including the kitchen. It is also ideal for maintaining the look of newly installed grout and tile. The example below shows what would happen in the event of a spill such as grape juice, wine, coffee, pet urine or any other liquid that would usually leave a stain in the grout. It simply wipes off with a paper towel leaving no stain!